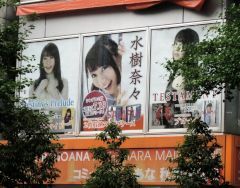 In the middle of July 2017, there were advertisements in the second floor windows of Toranoana for the latest CD by Mizuki Nana. In the middle of July 2017, there were cosplayers in front of Radio Kaikan passing out small fans for the anime goods shop Amiami. 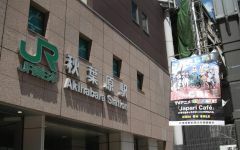 Amiami had just opened a store inside Radio Kaikan. In July 2017, there was an outfit exhibit for Tenshi no 3P. 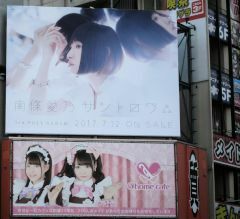 At the end of June 2017, there was a large advertisement on the main street of Akihabara for the 3rd album by Nanjou Yoshino. 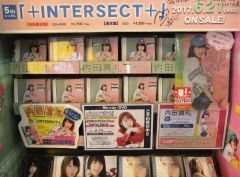 At the end of June 2017, there were displays at Gamer for the 5th single by Uchida Maaya. 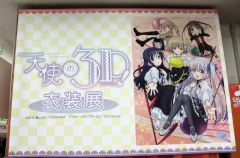 At the end of June 2017, there were advertisements in the second floor windows of Toranoana for the latest CD and BD/DVD by the seiyuu group Yui Kaori. Between June 17 and June 30, 2017, there was a collaboration at Atre Akihabara for the TV anime High School Fleet. 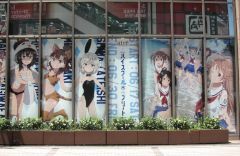 In the middle of June 2017, there were tapestry advertisements near Akihabara Station for the Kemono Friends CD Japari Cafe.